The bus went snow-birding in early February, as we toured Florida. 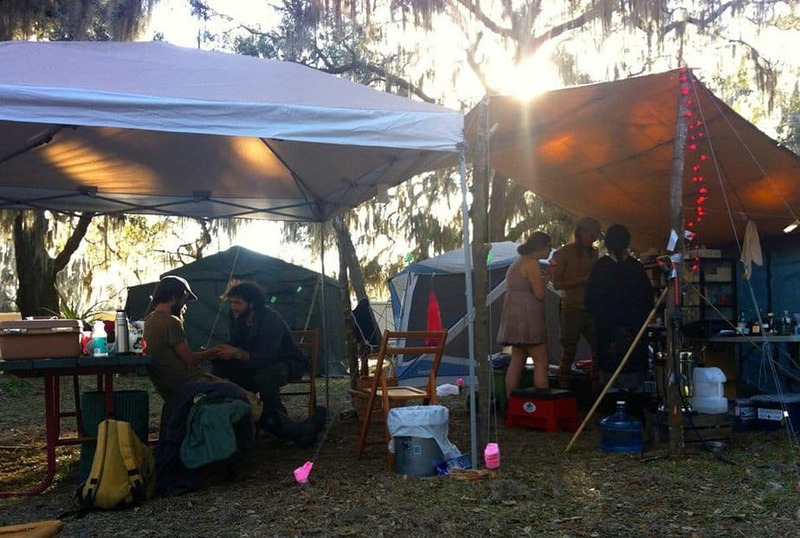 The photo above shows our first aid station at the Florida Earthskills Gathering. It is a privilege and pleasure to be able to offer support at events such as these, which preserve and promote a culture of earth protection and respect. Working a station such as this is a chance to see herbs in action, learning by doing and by observation. We benefit from noting our patients’ experience, from seeing herbs work and not work, and through skill-sharing of materia medica and clinical techniques with the other practitioners we serve alongside. Next the Bus headed south to St. Pete’s to run a workshop and clinic practicum for the clinical students of the Acupuncture and Herbal Therapies Training Program. Day 1 reviewing the Herb Bus Service Manual and making preparations for the next day’s clinic. Instead of working from the Herbalista Kits, this time we custom built herbal kits on site. This was important for a few reasons. First, we wanted the kits to reflect THEIR style of herbalism and be filled with the tools the students are used to working with (this school practices from a chinese-western blended herbal perspective). Next, it’s just fun to build them. It makes you consider every aspect of your clinical practice– which herbs you use, in what quantities, what types of preparations, how you dispense them, how can you arrange them in an efficient way, and how can you add a little bling (it’s all about the gold duct tape). And what is really thrilling, is that when the Herb Bus rolls out of town, the kits will remain in St Pete’s, with the students, hopefully for many clinics to come! Day 2 brought severe thunderstorms, but in the style of good health we were flexible. Instead of working out of the Herb Bus, under the elements, we held our clinic in the shelter of the center. Click here for photos.